While I'm in Vegas having a great time, I see that Josie and grrouchie are taking turns mocking me on Josie's latest post and comments. It's ok. I'm having too good a time to be concerned. Things started out in fine fashion when Prudence greeted me at the WSOP by taking off her shirt. Well, ok, that's perhaps misleading. She did take off her t-shirt right in the middle of the Deepstack tournament she and Tom were playing in. But there was nothing salacious about it. She was perfectly covered up underneath. It was G-rated. But she took off her shirt because she was wearing it inside out (on purpose) and wanted me to see what the decoration was. 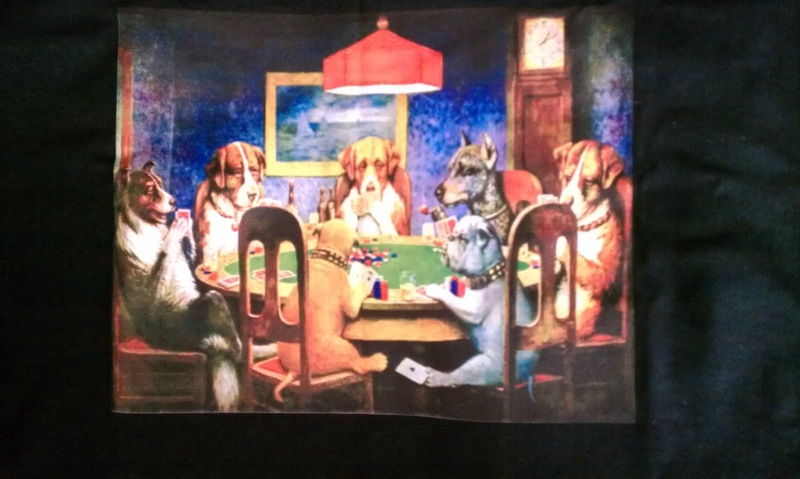 It featured a pint of the famous painting of dogs playing poker, and it was basically the exact same shirt that I wore to the last month's Crazy Pineapple game, as I mentioned here, and she wanted to show me. Not sure why she was purposely wearing it backwards until I showed up. We should coordinate one time to both wear our shirts on the same day to the same venue. Anyway, even before I got to Vegas, Prudence had been asking me to join the two of them in this Deepstack event at the WSOP. But that was the day I drove in from L.A. I figured I would be too tired from the drive and leaving L.A. early to be up for a Deepstack tournament where, if I did really well, I might still be playing in during the wee hours of the next morning. So I showed up when I got to town to rail for them and cheer them on. I must have brought them good luck since they both cashed, with Tom lasting longer than Prudence (I understand that women love it when that happens). But I got there right before the first break, so during the break we caught up a bit and the two of them were selling me on the idea of playing at the cash games running as part of the whole WSOP festivities. 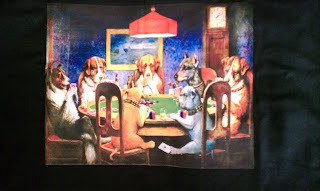 Furthermore, they encouraged me to play 2/5, not 1/3 (the cheapest cash game they have). They felt the 2/5 game was, I guess, "jucier" than the 1/3 games, and also, that, it is less affected by the high rake that all Caesars Properties take. Whereas most rooms in Vegas max out at $4, Caesars Properties, such as Rio where the WSOP takes place, max out at $5. Over the long haul that extra dollar adds up, and it is even more noticable with the presumably smaller pots at a 1/3 game than at a 2/5. Since Tom deals at a room that only takes $4 per pot, the rake here irks him no end. I asked what they buy in for at the $2/5 game. My thought was you have to buy in for at least 100 big blinds. Thus at 1/2, I buy in for $200. If I were going to play 1/3, I'd buy in for $300. So if I play 2/5, don't I have to buy in for $500? They said no. They've been buying in for the minimum, $200 and have been doing fine. They start out playing a short stack strategy, as I did when I first started playing NL, and when you double up a time or two and have a good stack, then you can start playing some "real poker." They made it sound like it would be highly likely to double up because of the loose play at these tables. So when I was ready to play, I stepped up the biggest game I've played to date, 2/5 NL. Yeah, even bigger than when I recently stepped up to 2/3 as I described in the post here. Details will follow, but I did ok at the game, not great. I never dropped below $140 and was almost $100 up at one point. But this particular table wasn't quite as loose as they described; in fact it was pretty tight. Thus when I did get good cards and raised, I didn't get a lot of action. That plus a general lack of good cards preventing me from doubling up. I left only a few bucks ahead, but I pretty much had to leave. Even though I knew to bring a sweatshirt, it just wasn't enough, it was absolutely freezing in the room. Everyone at the table was talking about it. Before chasing me away, the freezing cold chased away a very attractive blonde who was at our game. Damn them. I had a much better time playing 1/2 back at BSC later that night, all the while getting updates from Prudence on the success she and Tom were having back at the Rio. I ended the night up $300 between the two sessions. Today I got a late start playing poker due to having to change hotels. Perhaps I will rant a bit about that in the future. But I finally made it to BSC and had a pretty good session. Details to follow, but I did have one really great hand when I was dealt Jack/9 suited and flopped a gutshot straight flush draw (Q/8 clubs, plus another 8). This was the third time I'd flopped a gutshot straight flush draw in the session. First time I missed everything. Second time I rivered the flush only, and it turned out I won the pot because the other guy had the lower card I need to make the straight flush. So his flush was one card lower than mine. Between the two of us we had the straight flush. But on this hand, the turn was a blank and the river was an absolute gorgeous 10 of clubs for the absolute nuts. My opponent led out for $15 with his trip 8's (it was limped pot and there wasn't much betting on the flop or turn, so that wasn't as little a bit as it sounds). I made it $45 praying he would come over the top, or failing that, at least call. But he showed his 8, said, "I guess my 8 is no good" and folded. I showed my hand, because when you get a hand like that, you have to show it, don't you? It was only the fourth straight flush I've gotten since I started playing Hold 'Em, and the first one since switching from limit to No Limit. The most recent one before this was described in this post here. Well, that's enough of an update for now. More reports from Vegas will follow, to be sure. Stay tuned.